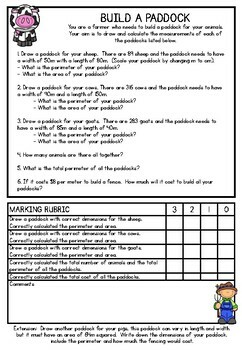 Inquiry Based Maths Assignment; Build a Paddock- Extend learning of perimeter, area and basic operations with links to the real world. Grades 3-5. Enrich and extend your students' understanding of perimeter, area and basic operations with this simple but effective build a paddock project. Students link their learning to real life by creating a range of different paddocks for animals and calculating the cost of fencing. Perfect as an extension for those early finisher or just as an assignment at the end of a perimeter and area unit. This worked beautifully for my more advanced students who needed a deeper learning of perimeter and area.